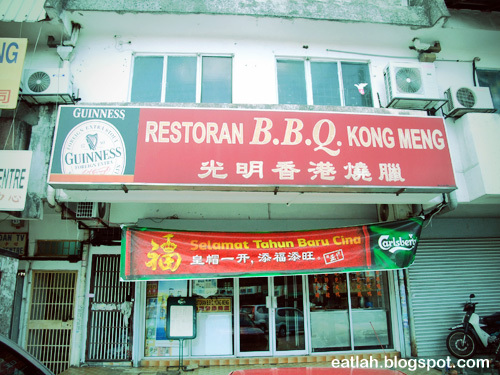 Restoran BBQ Kong Meng @ Cheras, KL | where and what to eat lah? Restoran BBQ Kong Meng is isolated deep within Cheras in Taman Maju Jaya (nearby to Taman Shamelin Perkasa). Still, it is always packed during the lunch time. It was only 12:30 noon and it was already crowded till the queue extended out to the hot street. Service was really bad, my queue got cut just because I didn't have enough people to fill a table, I was pissed and eventually gave up waiting! However, I was still curious, so I went back a month later. I'm smarter this time, it was only 11:30 morning and service was much better due to a smaller crowd. For all the hassles, it is only for one reason - "quack quack". 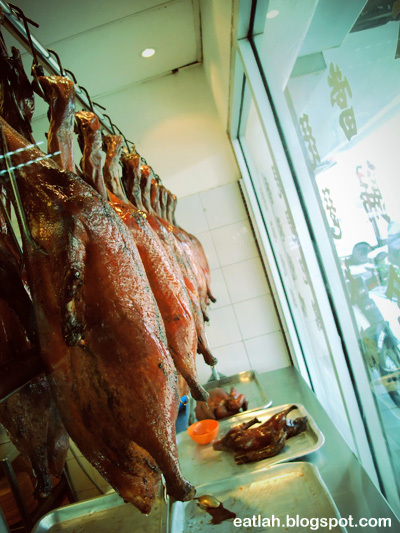 Kong Meng's famous roast ducks take pride in their crispy skins and tender meat. 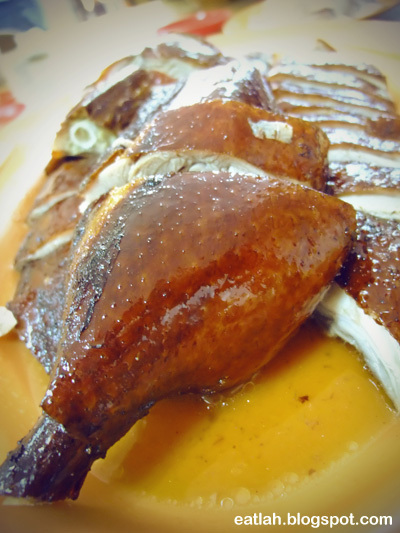 Before serving, each roast duck is carefully bathed in hot cooking oil to give the skin a shiny crispy glaze. 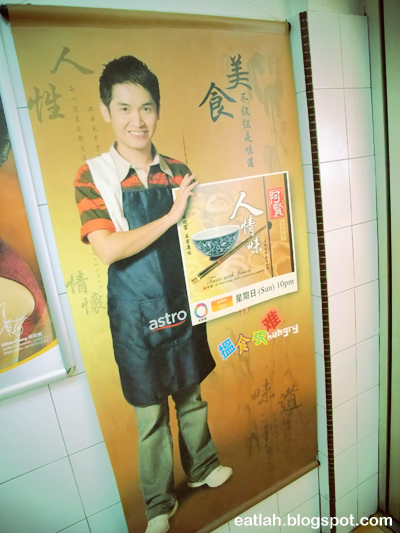 Kong Meng sells mainly roast ducks with other side dishes such as siew yoke (roast pork belly), char siew (barbeque pork), cold dish sliced pork knuckles, stir fried mushrooms and vegetables. The essence of the dipping sauce extracted from the roast duck gave a pleasant herbal fragrance and it complemented well with the tangy chili sauce. Half portion of roast duck (RM 27), crispy skin that 'almost' melts-in-your-mouth coupled with nice tender meat with a hint of Chinese herbal spices. Good thing there wasn't much fats underneath the skin, it was probably drained out from the slow roasting process - my type of low fat diet! 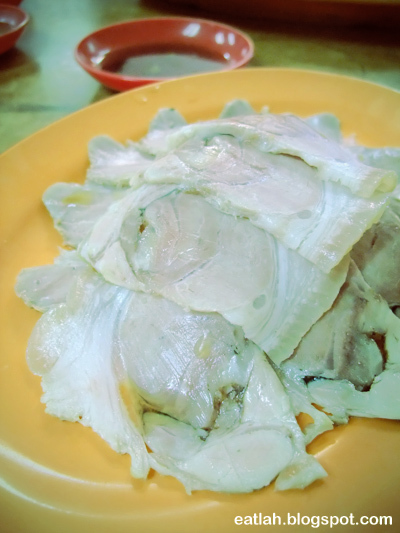 A cold dish made of thinly sliced marinated pork knuckles (RM 10) served with a light sourish soy sauce. 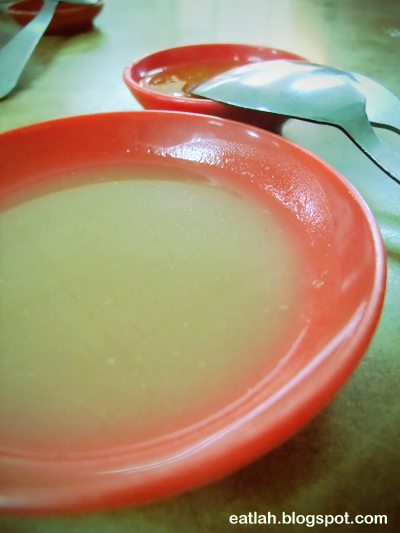 It was rare, cold and a recommended dish, unfortunately, it wasn't my cup of tea. Verdict: Roast duck was good but not the best I've had (will write on that soon). Go early to avoid getting bad service treatment and long waits. Business Hours: Opens daily from 11am till it runs out (call to check). Just had lunch @ BBQ Kong Meng, the duck and sliced pork knuckles are awesome! Thanks russel for the detailed info. Keep up the good job!! 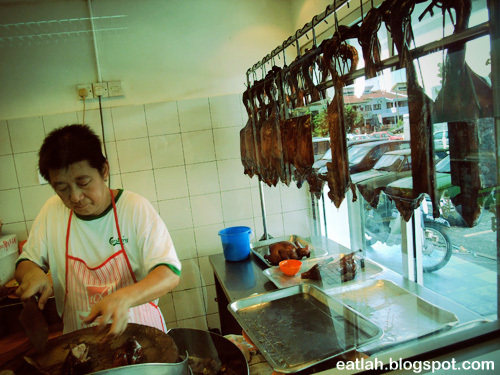 So where is the best roast duck in KL? What's your verdict?